You are here:Home-Should I accept my Injuries Board Assessment? Should you accept your Injuries Board assessment? Always appoint a solicitor before accepting settlement. As per the 2016 PIAB Report, 45.5% of applicants rejected the Injury Board assessment and an Authorisation was issued allowing them to proceed to Court. Complete the enquiry form & Gary Matthews Solicitors will issue the relevant Court proceedings on your behalf. Always consult an expert before accepting assessment. It is vital to realise that you are under no legal obligation to accept the Injuries Board Assessment. Once you receive your Assessment from the Injuries Board, it will contain a figure which they estimate reflects the full value of your claim. Always get a second opinion on your claim. The question you have got to answer is – is this figure a fair and reasonable amount to compensate me for the injuries, pain and suffering (both past and present) and all out of pocket expenses and loss of earnings I have sustained? The only person who can answer that question is someone who has many years of legal experience in handling similar cases. If you are reading this article that person is most certainly NOT YOU! Each year thousands of people are injured through no fault of their own, it can be a stressful and worrying time. Accidents can occur at work, road accidents, medical negligence, whilst on holiday or out in public. Our Team will offer great advice and the best in client service. We will offer clear advice and achieve the best possible outcome for you. A similar example is an old oil painting that has been handed down to you and which you have been told is valuable. If someone calls at your door and offers a certain figure out of the blue, would you accept it without instructing an expert valuer/art specialist. Of course most people would get the experts’ advice first and this is exactly what you should do. Now let me explain why you should do the same with your Assessment. The first question you must ask yourself is – has the Injuries Board taken into account the full extent of my injuries (both physical & psychological) and/or have I fully recovered from my injuries? If the answer to either of these questions is no, then you should seriously consider contacting us as we are experts in personal injury claims and will ensure that you get the advice and support you need. 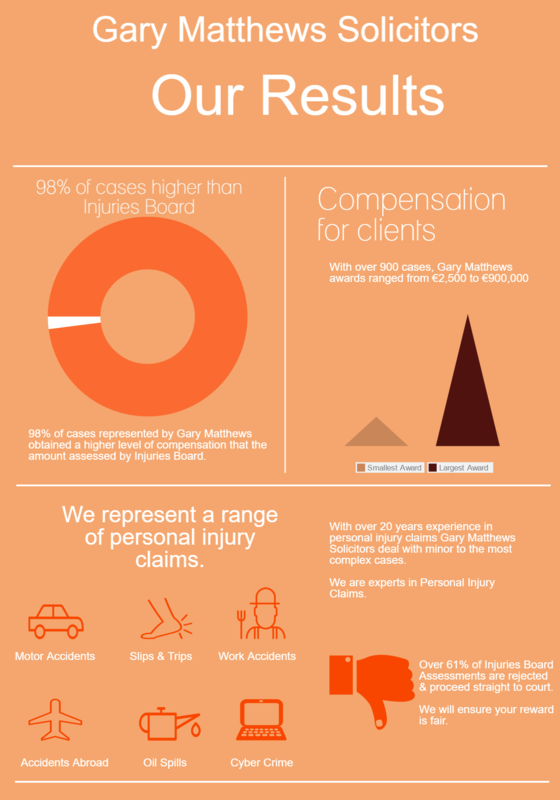 Gary Matthews Solicitors have over 20 years experience in dealing with these claims – Contact us today. The second question you should ask yourself is – what will happen if I reject the Injuries Board Assessment and issue proceedings and proceed to Court? Well, in 95% of cases that Gary Matthews Solicitors have dealt with [where the assessment has been rejected by the claimant], we have obtained a more favourable outcome than the Injuries Board assessment figure. So don’t take my word on it, the Central Bank commissioned an independent report in 2010 that asked that specific question. The purpose of the report was to establish whether insurance companies were acting within the applicable Consumer Protection Code. The report examined 418 third party personal injury claim files processed by eleven insurance firms in the period between the months of April, May and June of 2010. The files related to a range of personal injuries from less serious soft tissue cases to accidents which resulted in individuals having their quality of life radically changed, with the injuries arising from a wide range of accidents including road traffic, workplace and public place related accidents. The report established that where assessments made by the Injuries Board were rejected, the settlement amount ultimately secured by the claimant was higher in every one of the 418 files than the Injuries Board’s assessment. These findings provides clear evidence that those claimants who are willing to persevere and press ahead with court proceedings are more likely than not to end up securing more compensation. Follow this path and contact us immediately so that you can obtain the fair and reasonable compensation you deserve. After all, the accident was not your fault. To view the the full report click here. Get a second opinion on your claim. Email the Assessment you have received from The Injuries Board to email@gary.ie for an opinion on whether or not the Assessment is fair and reasonable. Once we receive it we will contact you within two working days.